Awwwww! 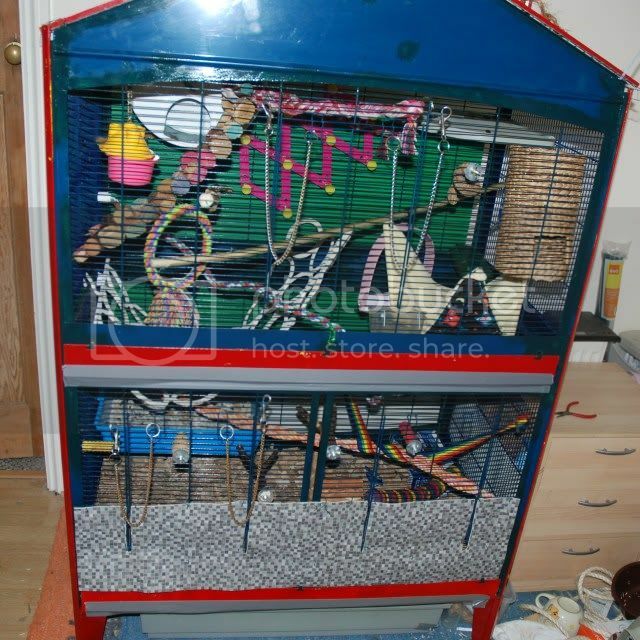 i hope the ratties appriciate the blood and sweat shed for them i think you have earned a long rest now after all your hard work and cuts,grazes,pulled muscels, but at least it is up now even if a bit like faulty towers but hey im sure the ratties will love it and love you forever for making them a super big home. Rats have to wait another 3 weeks before they get to move in heh. Errrrrrrrrr....Miss Beri......That ain`t good enough.....Where is the photo...I can`t wait ! Jillybean wrote: ...Where is the photo...I can`t wait ! It's not been taken yet. Wow, good job restoring a cage like that. I probably would have given up on it..
Alfons Åberg, Loke and Krakel Spektakel. Ozzy Osbourne, James Dean, Sputnik, Ikaros and Yoda. Beri is currently offline - once they get an internet connection sorted, the 'photo coming soon' a few posts above will miraculously change to become a picture of the finished cage. ...it's a plan we cooked up to enable the picture to appear on this thread (for the sake of completeness) after this forum was locked (which is happening later today!) knowing that that was likely to happen before she got online again.